Choose from three different LED color temperatures: soft warm (3,500K), neutral white (5,000K) and natural daylight (6,000K). Each light setting can be further customized by the smart touch dimmable feature. Easily dim or brighten each light setting with a simple touch to help you achieve the exact amount of lighting to suit your preference. Smart memory feature remembers your last used light setting making it convenient for you to go back to. The Fancii tricolor vanity mirror is equipped with 37 ultra-bright LED lights and a premium quality, distortion-free glass panel - ideal for creating flawless makeup looks and hairstyles under any light setting. Two magnification options ensure that every detail of your hair and makeup is perfect. The 1x mirror is great for viewing your overall look while the powerful 15x detachable mirror is suitable for close-up work. The 15x mirror features rear-mounted suction cups so you can easily remove it and take it with you anywhere! Complete angle coverage via 180-degree front to back tilt with 180-degree horizontal rotation. Multiple angle options ensure optimal viewing and allow you to check your hair and makeup from any perspective. Our stylish mirror with gorgeous chrome inlays sits elegantly on any table, vanities or countertop. The base tray conveniently stores makeup, tweezers, hair accessories, and more. The heavy duty base ensures a stable platform that stays in place. 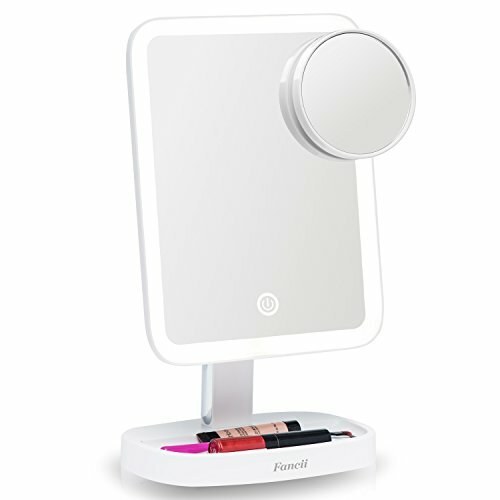 The mirror is powered by either 4 AA batteries or an included USB cable which you can plug into a powerbank, laptop or wall adapter. Easily detach the base from the mirror and pack away for your next holiday. ★ Adjustable Light Settings ★ 2x brighter and more color correct than the average. Choose from soft warm, neutral white, and natural daylight. 3 dimmable light settings simulate day, evening, and home, so you can feel confident wherever you are. ★ Exceptional Clarity ★ Large, distortion-free glass with 1x and 15x dual magnification - 1x normal view is ideal for makeup application while the detachable 15x magnifying mirror is perfect for close up work and tweezing. ★ Maximum Adjustability ★ 180-degree swivel provides both horizontal and vertical rotation for optimum use at any angle, so you can look your very best! ★ Travel Ready ★ Power with the included USB cable or go cord free with 4 AA batteries, making it the perfect travel companion for any woman. ★ Cosmetic Stand ★ Our stylish, modern mirror with chrome trim measures 12.5" tall and 7" wide so it stands elegantly on any table or countertop. The storage base holds small makeup accessories and jewelry. If you have any questions about this product by Fancii, contact us by completing and submitting the form below. If you are looking for a specif part number, please include it with your message.